I gave a talk about gerrymandering at the Prairie Unitarian Universalist society. As usual, I showed how you can pretty easily district a state with a 60-40 partisan split to give the popular majority party 60% of the seats, 40% of the seats, or 100% of the seats. After I do that, I ask the audience which map they consider the most fair and which they consider the least fair. Usually, people rate the proportional representation map the fairest, and the map where the popular minority controls the legislature the least fair. 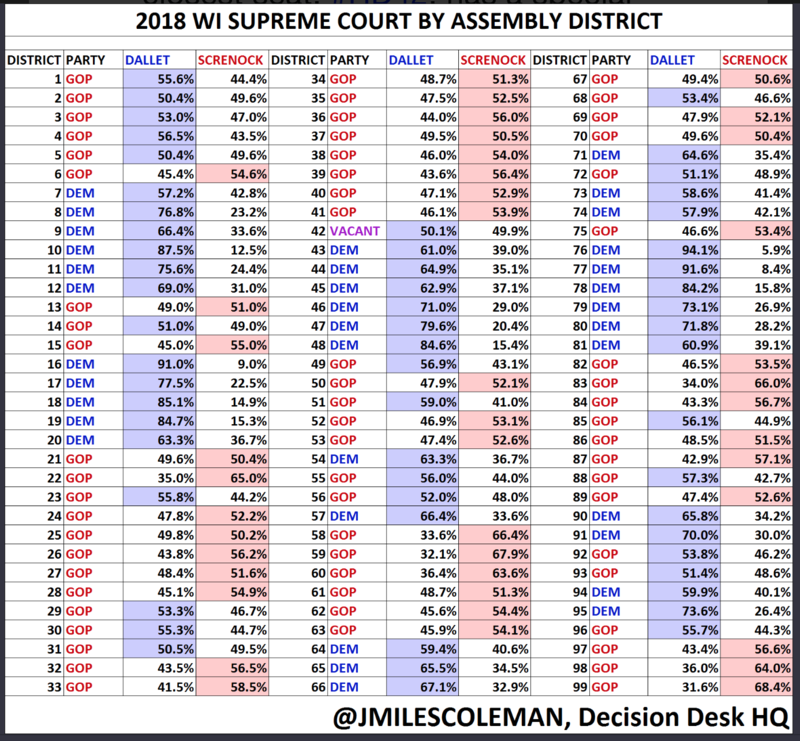 The oral arguments in Gill v. Whitford, the Wisconsin gerrymandering case, are now a month behind us. But there’s a factual error in the state’s case, and I don’t want to let it be forgotten. Thanks to Mira Bernstein for pointing this issue out to me. And I think the easiest way to see this is to take a look at a chart that plaintiff’s own expert created, and that’s available on Supplemental Appendix 235. This is plain — plaintiff’s expert studied maps from 30 years, and he identified the 17 worst of the worst maps. What is so striking about that list of 17 is that 10 were neutral draws. There were court-drawn maps, commission-drawn maps, bipartisan drawn maps, including the immediately prior Wisconsin drawn map. That’s a strong claim, which jumped out at me when I read the transcripts–10 of the 17 very worst maps, according to the metrics, were drawn by neutral parties! That really makes it sound like whatever those metrics are measuring, it’s not partisan gerrymandering. But the claim isn’t true. Let me unpack what Jackman’s saying here. These are the 17 maps where we can be sure the efficiency gap favored the same party, three elections in a row. You might ask: why wouldn’t we be sure about which side the map favors? Isn’t the efficiency gap something we can compute precisely? Not exactly. The basic efficiency gap formula assumes both parties are running candidates in every district. If there’s an uncontested race, you have to make your best estimate for what the candidate’s vote shares would have been if there had been candidates of both parties. So you have an estimate for the efficiency gap, but also some uncertainty. The more uncontested races, the more uncertain you are about the efficiency gap. So the maps on this list aren’t the 17 “worst of the worst maps.” They’re not the ones with the highest efficiency gaps, not the ones most badly gerrymandered by any measure. They’re the ones in states with so few uncontested races that we can be essentially certain the efficiency gap favored the same party three years running. Tseytlin’s argument is supposed to make you think that big efficiency gaps are as likely to come from neutral maps as partisan ones. But that’s not true. 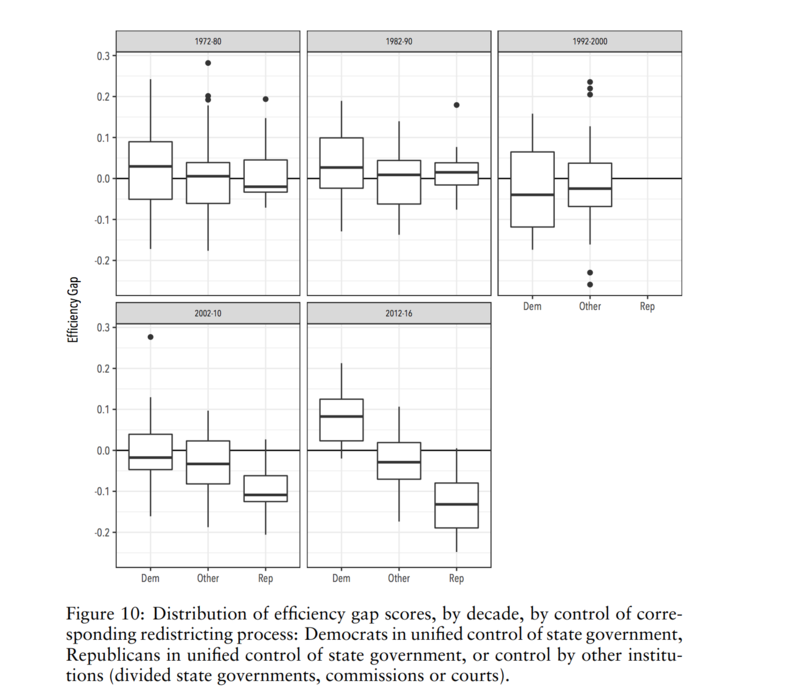 Maps drawn by Democratic legislatures have average efficiency gap favoring Democrats; those by GOP on average favor the GOP; neutral maps are in between, and have smaller efficiency gaps overall. That’s from p.35 of another Jackman paper. Note the big change after 2010. It wasn’t always the case that partisan legislators automatically thumbed the scales strongly in their favor when drawing the maps. But these days, it kind of is. Is that because partisanship is worse now? Or because cheaper, faster computation makes it easier for one-party legislatures to do what they always would have done, if they could? I can’t say for sure. Efficiency gap isn’t a perfect measure, and neither side in this case is arguing it should be the single or final arbiter of unconstitutional gerrymandering. But the idea that efficiency gap flags neutral maps as often as partisan maps is just wrong, and it shouldn’t have been part of the state’s argument before the court.